CORONA, Calif. (Jan. 26, 2016) – Getting you Out & Back again, that’s always been the focus of the Outback tire line from STI Tire & Wheel. From the original 25-inch Outback AT to the monster 34-inch Outback Max, these tires deliver all-around performance in sizes and styles for any off-road enthusiast. With the all-new Outback HT tires, STI Tire & Wheel brings that multi-purpose and multi-terrain attitude to owners of mid-size utility off-road ATVs and UTVs. The new Outback HT tires feature a wider and flatter profile for stable and smooth performance. The familiar Outback tread style features a stepped-lug design that adds strength, plus dimpled lugs along the shoulder that offer increased dirt-grabbing surfaces. The center “V” tread pattern uses solid-center blocks for ride comfort, long-life durability, and sure-footed performance on hard surfaces. It’s a design that’s built to last through long days of work or trail rides. The Outback HT is available in seven sizes from 23-inch up to 25-inch, making it ideal for a wide range of ATVs and small UTVs. Like all Outback tires, the HTs use a 6-ply bias carcass and a built-in rim guard for durability without adding weight. Launched in 2013, the Outback tire line also includes the Outback AT, XT and XLT tires in sizes from 25-inch through 28-inch, plus the mud-performing Outback MAX tires with their deep lugs and sizing from 28-inch up to 34-inch. 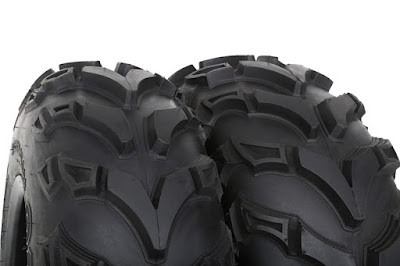 STI Tire & Wheel experts designed the complete Outback line to cover the in-demand sizes and fitment applications for today’s ATV and UTV owners. Suggested retail prices for the new Outback HT tires range from $83 to $117. STI Tire & Wheel designs and manufactures tires, wheels and tubes for owners of off-road motorcycles, UTVs and ATVs. Launched in 2010, STI is lead by powersports industry veterans with a deep understanding of the needs of off-road enthusiasts. The company remains focused on delivering excellent products backed by industry-leading customer service.